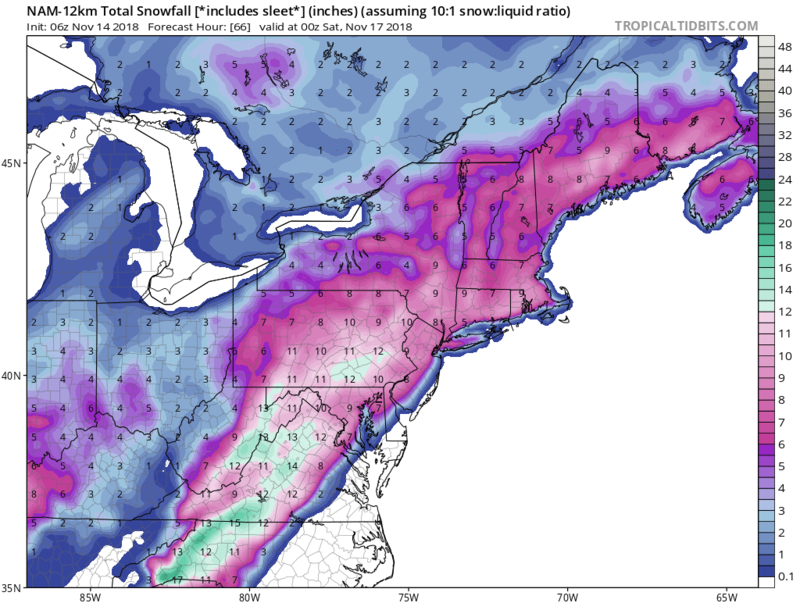 Snj gets snow on the Nam. 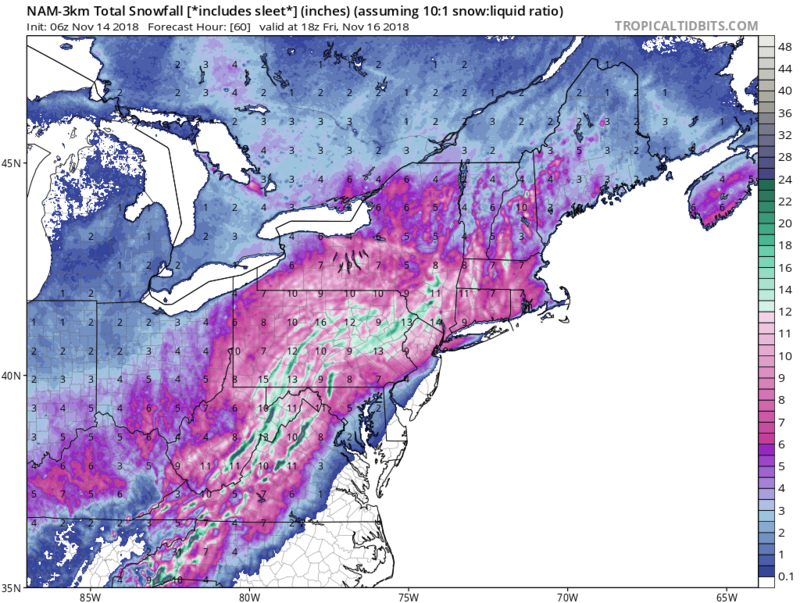 The NAM which killed it last winter is showing signs of leading the way. @Syo love the kindergarten coloring job on teh map adn I see how this is quite possible and may come to fruition. 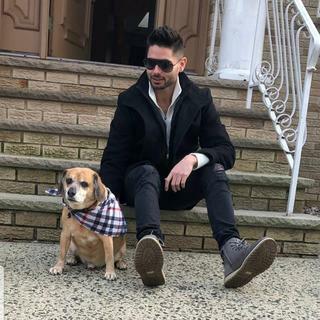 Good bold cal my man. Wth is that hole of nothing in Westchester and parts of nj and ct?! Syo this ur fault ur map!! NYC gets snow but not us that hole makes no sense. jmanley32 wrote: Wth is that hole of nothing in Westchester and parts of nj and ct?! Syo this ur fault ur map!! NYC gets snow but not us that hole makes no sense. Why is this what I want? 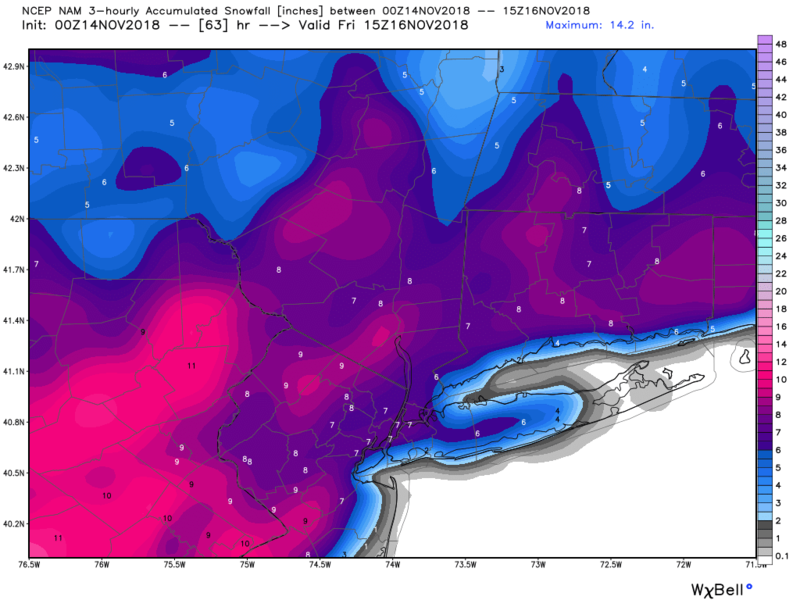 A snow hole with nada but rain but all areas around me within a 10 mile area see 2+ inches including NYC, thats just plain aweful. Okay 3km NAM MUCH better, and includes ALL. Ouch a ton of frz too, with wind gusts to 40mph, we could be looking at a lot of power outages too. A lot of this may be frz and sleet, as I do not think weatherbell accounts for the differences and the snow map just adds it all together, and man they dont have te 06z of 18z euro that stinks, why? Jman you always want IMBY so that is why I posted this map above. 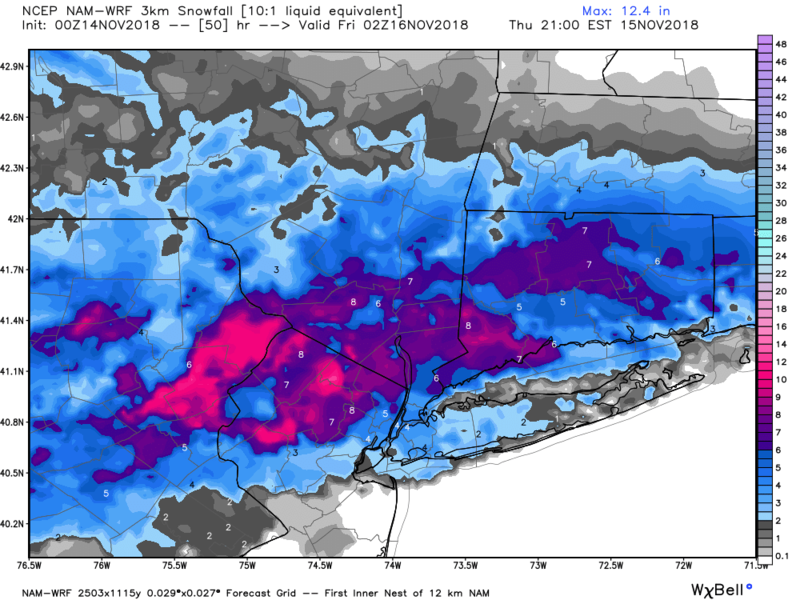 Skew T on NAM Hi RES have about .5" of liquid falling as snow in NYC Metro before changing to sleet then zr - all of which is about .3" then abou .3" of rain. The burbs N& W by about 25 miles ae snow then sleet and zr then drizzle at best. amugs wrote: Jman you always want IMBY so that is why I posted this map above. 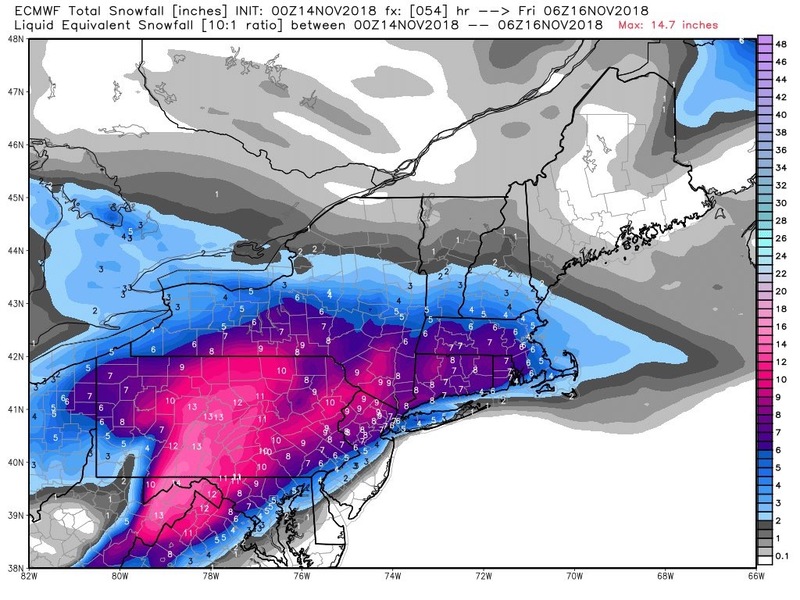 That NAM map shows a huige show hole N and east of NYC, I am not understanding what you are saying but no other map shows that so I am gonna say its flawed lol, praying it is. weird how different sites maps are not the same, look at 00z nam from wxbell vs. pivotal wx above, no snow hole and higher amounts. A challenge with snow maps is the algorithms may take into account sleet and frozen rain in their snow calculation, while some snow maps are good at just picking out what falls as snow. That's why it is important to understand boundary temps and other factors rather than trusting snow maps off-hand. Very tough call with with boundary levels an issue. One thing I see several people mentioning which I don’t believe will be an issue is sun angle and ground temps. The afternoon sun angle in mid November is the same as mid January so I don’t see this as an issue at all. Ground temps other than roads in urban areas also not an issue. Water temps other than immediate shore areas also will not come into play think November 6 2012 snow storm. How quickly the mid levels warm is the key here to snow totals. CP I agree with you on the sun angle is not an issue. However i do think ground temperature are still warm. in the cold morning only the top thin layer is frozen and in the wet areas of my yard its not even frozen. This was never a sgoing to be a snow storm for us coasties but to be tracking this early in season is a great sign to come. Northwest and west folks going to be surprised on what's coming. skinsfan1177 wrote: This was never a sgoing to be a snow storm for us coasties but to be tracking this early in season is a great sign to come. Northwest and west folks going to be surprised on what's coming. wow that's increased a bit gr8 p m 18z u don't have ghetto p far from coast to get into good snows verbatim on those and euro but I still think a lot of that is other types of frozen precip. Those maps have to be including other ptypes. It just won't be cold enough long enough for that kind of snow to take place.